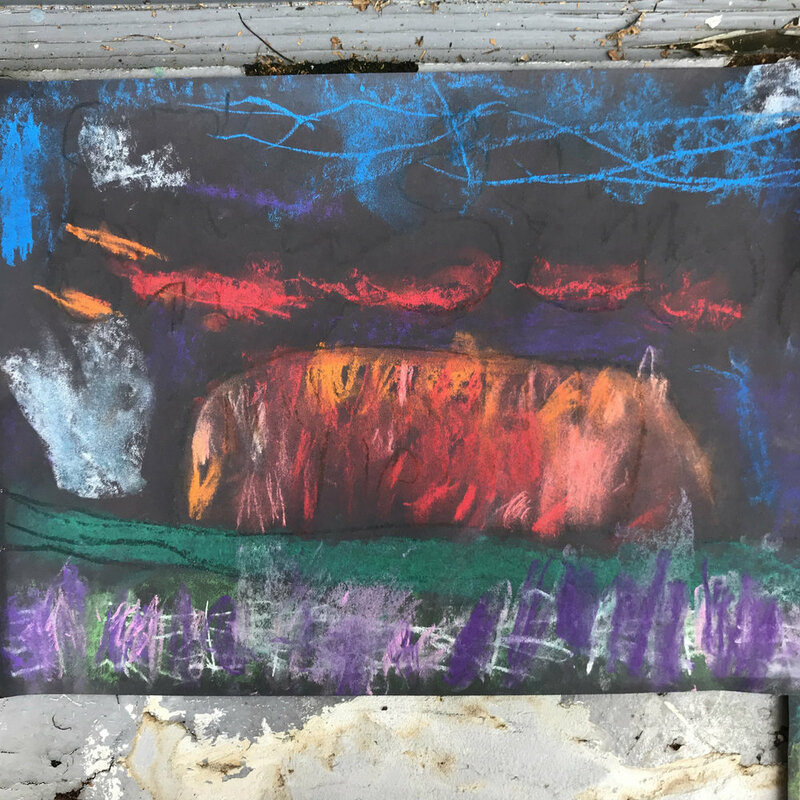 These Uluru landscapes with their vibrant colors were a huge success and a great way for the kids to learn several different ways to use their soft pastels! We recently started a unit on Australia, and the kids were excited to take a virtual trip to the Land Down Under! Ayers Rock, or Uluru, as it is known by the native people of Australia, is an iconic Australian image and listed as a World Heritage site. 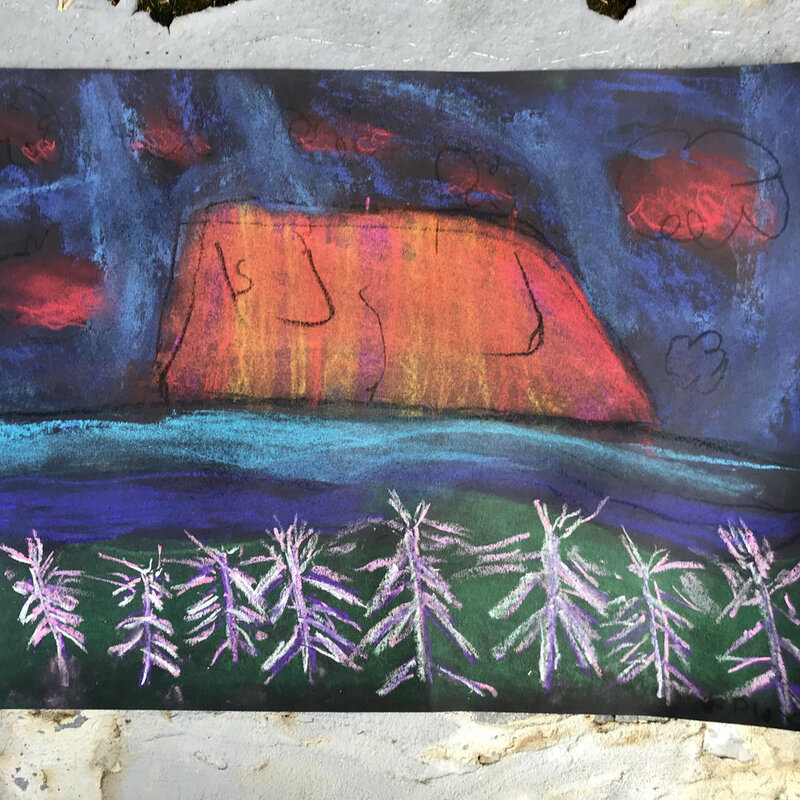 One of the MOST interesting things we learned about Uluru is that it is what is known as an inselberg—sort of a land iceberg if you will, with most of its mass underground and connected to another mountain, Kata Tjuta many miles away! The rock appears red at sunrise and sunset with the slant of the sunlight hitting the iron deposits in its rock. 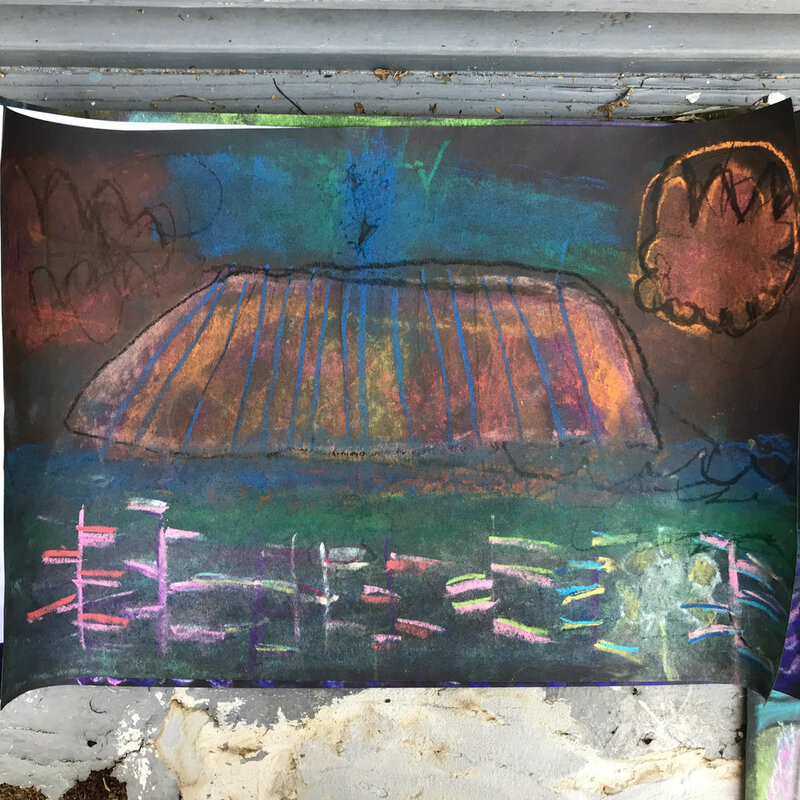 This Project Artwork was fabulous for teaching the kids the concepts of what a landscape is, the various parts of a landscape, ideas of near and far, and how to create a sense of space or depth on the page. We switched to cool colors for the sky, parts of the middle ground and the mulla-mulla, a native Australian wild-flower and another completely fun word to say! 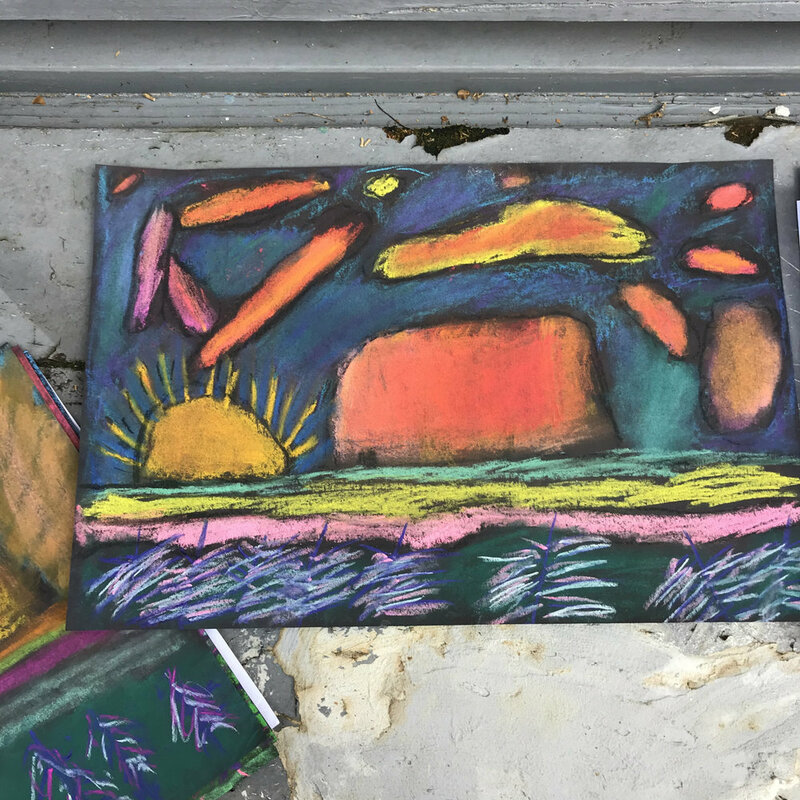 This was also the perfect project to introduce the kids to the different ways they could use their soft pastels. I call this tactic sneak-technique! The kids are so engaged in the project, they don’t even realize I’m teaching them good art techniques! 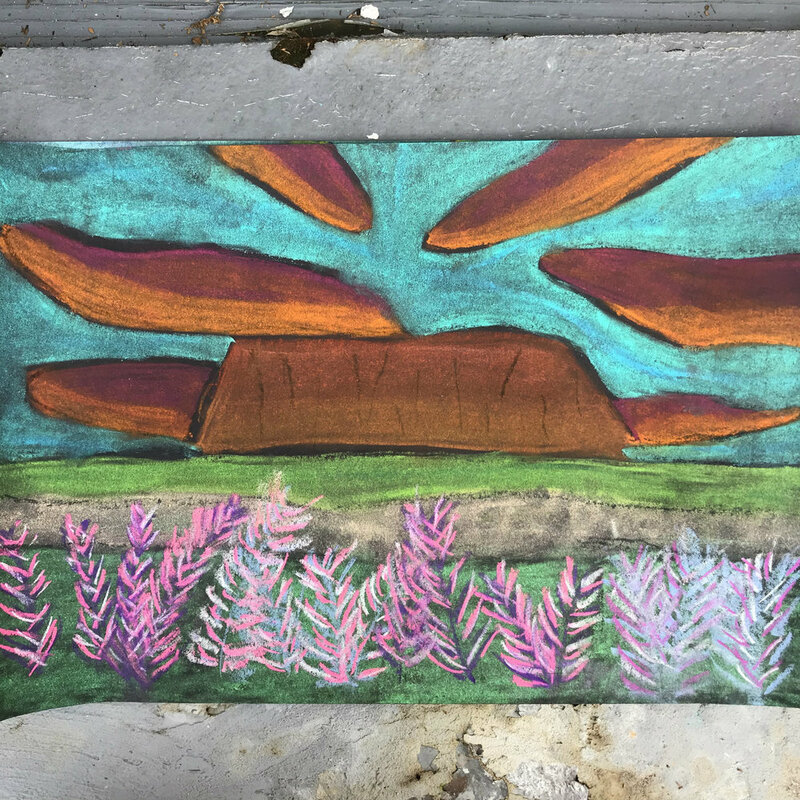 We practiced using both the side and the tip of the pastel—using the side to cover large areas, and the tip for smaller areas as well as drawn or textural elements like the mulla-mulla flowers in the foreground. We also experimented with what I call two-finger blending ( NOT the whole hand!). They learned how to blend in certain directions and how to not OVERblend and make their art look like mush! EVERY child had success with this. My group ranged from 5 year olds to 5th graders and they were all able to successfully accomplish this project with beautiful, individualized results! I’m so proud of my young Project Artists!